The welcoming in of the New Year is often a time for looking back and reflecting on the year just past. For eShare, 2017 was a fantastic year of growth, to better support our new clients and strengthen our relationships with existing users of our solutions. We hope to continue this in 2018, but what is really firing us up are the plans we have for the upcoming 12 months. With so many new features and updates in our plans for the year, we have no time to waste in getting these out to you, which is why we’re delighted to announce the latest update to BoardPacks, which went live last week / which is going live next week. BoardPacks has long been the board portal of choice for organisations of all types and sizes around the world, and now it’s getting even better. Our award-winning intuitive interface has now been made even better with some UI changes designed to make organising and attending your meetings even easier than it was before. The most significant new features and enhancements are part of a broader drive to improve governance by helping our clients make better, more transparent decisions and get more done. We hold regular user groups and surveys, which provide us valuable feedback on what common pain points need addressing in your organisation and how our technology can help with this. The benefits of having your board documents available to you online and offline on your portable device are already well known, but with directors leading such busy lives, not many are afforded the luxury of being able to sit down and digest an entire document in one go. With our new document tracking feature, you can now pick a document back up exactly where you left it last time. Also, new and unread documents are highlighted by a blue dot next to them in the agenda view. Measuring governance is a difficult and contentious issue, but with BoardPacks’ Governance functionality, committee administrators can demonstrate how diligent their board/committees are by tracking how often documents are opened and how long they have been read for. 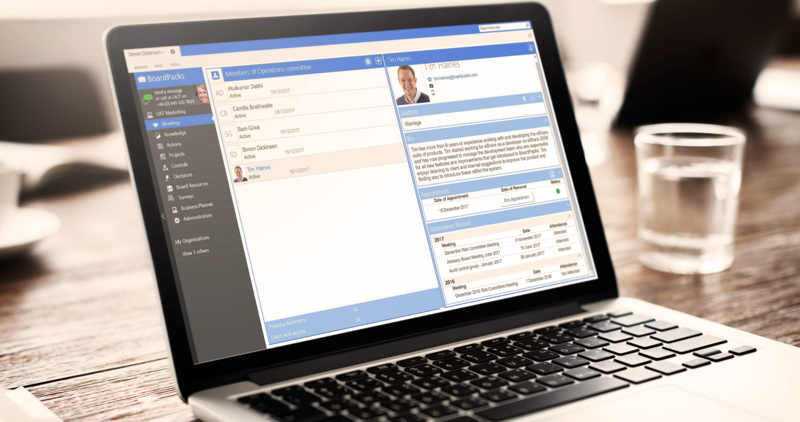 There is also an attendance record for each board member in a simple view, providing greater accountability and transparency over your board. Governance is also about having access to the right information to make good decisions. I’m sure that we have all been in meetings where time is wasted trying to refer back to items discussed in a previous meeting. In fact, this was something highlighted by Victoria Parsons, Company Secretary at Luton and Dunstable Foundation NHS Trust discussed in a recent eShare webinar, but this will now soon be a thing of the past with our topic history. Topic history will allow you to open an agenda item and see the public notes, actions, decisions and minutes from past meetings if this same agenda item has been discussed in previous meetings. BoardPacks has been improving the efficiency of meetings for more than 10 years, but topic history is a game changer for saving time and maximising your effectiveness. Most of these features will be turned off initially for existing clients, so you will be able to activate these new features when the time is right for you and your organisation. If you wish to learn more about the changes or tell us when you want to have these exciting new features made available to you, please contact our support team. Any new clients will be able to access these new features straight away. Simon Dickinson posted on 05/01/18 - 8:08 am & filed under Board Portal Technology, Updates.